Are you an alumnus/alumna, donor, staff or faculty member, or current student? Or do you know of someone who is? If so, and you have a compelling story that could make a great article for the Viewpoint, please let us know. 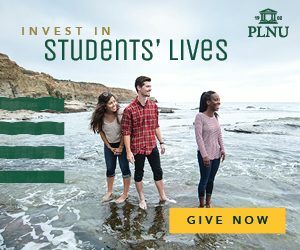 We’re always looking for engaging stories about members of the PLNU community and would love to share them with our readers. We ask that you please review previously published stories and articles for an idea of the type of content we tend to publish. If we think your story would be a great fit, we’ll reach out to you with next steps. Additionally, if you would like to write and submit the story yourself, please review our Writer Submission Guidelines. If you’re an alumnus or alumna and have shorter updates that you would like to have published in the Viewpoint magazine, please let us know! Share your major news and updates with us, including recent awards, career or school milestones, publications, or other great accomplishments (service-related, academic, athletic, artistic, professional, etc.). Although we can’t print all news updates due to space and content limitations, we do publish many of them in the Alumni section of the Viewpoint magazine. Any and all communications and editorial content distributed by Point Loma Nazarene University – including but not limited to printed materials and Web content – are intended to inform and engage both the Point Loma Nazarene University community and others, while adhering to the university’s mission and values. During the creation, editing and distributing of such content, the school will be guided by said values and principles. While Point Loma Nazarene University accepts editorial submissions, the school reserves the right to edit or decline to print material at its discretion.